This rose painting took me a long time to do. I had to wipe out and repaint several times to get what I wanted. 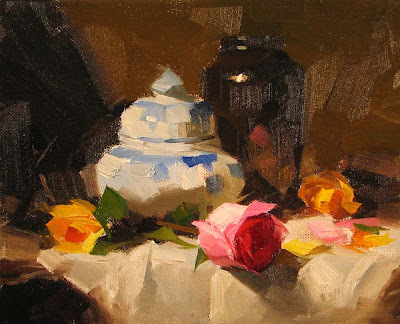 It is very easy to overwork when painting roses, and every brush stroke must be accurate and precise. It was so much fun, but it could be very stressful if it didn't work. 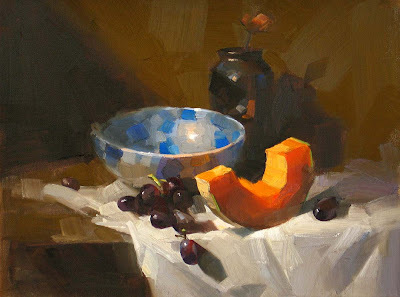 I think the job of a still life artist is to discover the beauty from the everyday stuff and share it to the world. I think I did my job today. When the light bounces back and forth on that bowl with blue patterns and then transmitted through the cantaloupe slide, I saw the combining effect is extraordinarily beautiful. The tranquil blue turns into a vibrant orange glow. Wow, I am speechless. Now I want share what I saw with you. 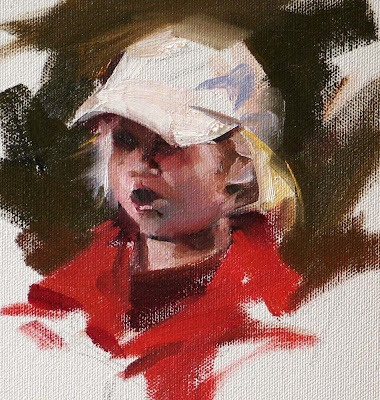 "A Little Girl in Red"
When I started painting about ten years ago. Figures and portraits used to be my favorite subject. However, due to the practicality of my working and living style, still life has been a suitable replacement. 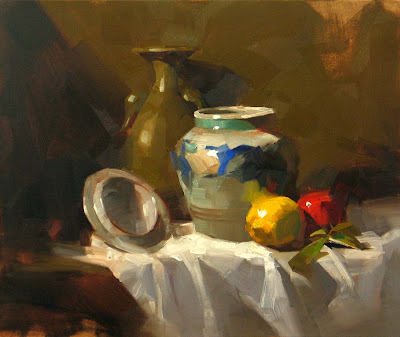 Now, having painting still life for many years, painting humans starts once more ticking my mind. Last night, I was browsing the photos I took when I was camping about two weeks ago. An image of a little girl fishing by the lake triggered my human painting mode. Well, after I started this one, I realized how remotely I am in managing the human form and color. There are a lot of issues in this painting waiting for me to tackle in the future, but at least it get me started on this relative new territory. I am not going to put this painting on eBay, but if you like to have it, please email me an offer, and I will send it to the highest bidder in seven days. 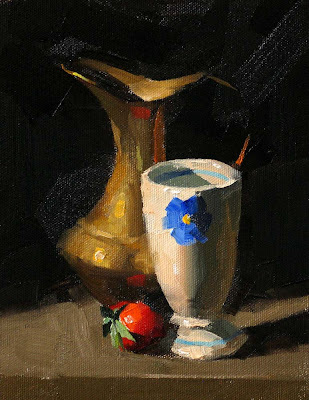 You probably have noticed that I had quite a few paintings lately with complete dark background. 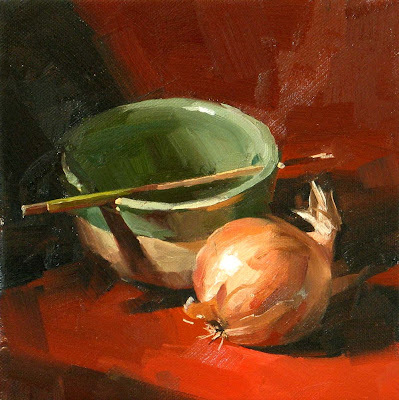 I think it will enhance the foreground and make the still life more standing out. I haven't changed my background design often and I love the diagonal casting shadows I use. But always painting the same way is boring. So I am testing and see if there is an alternative background design offering the effects I like. Having painted so many small paintings, I feel the need to paint some really larger ones. This a couple of days I got enough guts and painted this 20" x 24". I used this conservative composition so I could concentrate on the paint work. It is not as hard as I thought, but the effect is stunning to me. I am happy that the painterly effect still remains. My workshop at Magnolia was a big success. I want thank all the attendees. At this workshop I involved an art business session officially. I was amazed so many people are interested in blogging and online marketing. The discussion was so active. Now the workshop is over. I am going to go camping for a several days. I might not able access to the Internet for a while. This is my second demo I did at the workshop. 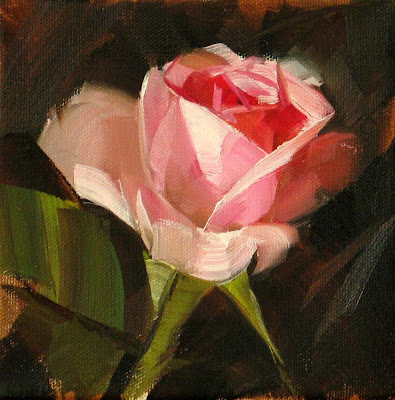 Hope you enjoy another my rose painting. This is my first demo painting at my Magnolia TX workshop. I am so excited to come back here again. I want express my sincere gratitude to Ms. Marty Hatcher for organizing this wonder workshop. I met many new friends and am having a wonderful time. 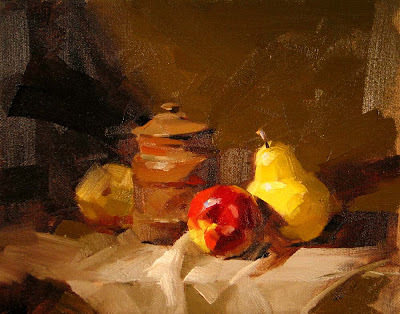 This workshop is very special to me and to my current and future students, because it will be documented and promoted by American Artist Magazine. You will be able to read about this workshop and my style of teaching on the April's issue of the "Workshop" Magazine. It is a significant milestone in my art career. I am very very happy about it. The time is gone like a flash, but I have not decided what to paint. One of those days happens more often and becomes one of these days. If you have been painting for a while, you know what I am talking about. Sorry today, I don't sound very inspiring to you. 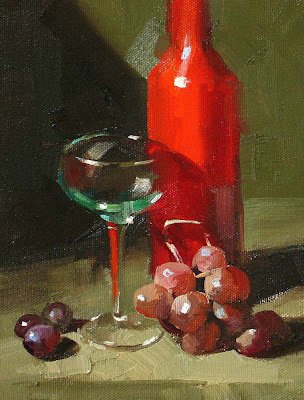 With this painting I am experimenting using dominant red background, which I don't do very often. It was difficult, but I did make it. I am also testing a new canvas I haven't used before. Several hours later I will be on my way to Magnolia TX. I will teach a workshop there. I will keep you posted. Got to run. See ya. Oh! You take it easy. Don't be rush like me. The optical effects of a glass always amaze me. I work as an optical engineer as my day-time job and deal with all kinds of glass media. From vision correction to transmitting data, it is so remarkable that a piece of transparent substance can do when light has been manipulated. Some people think that physics and art are so far apart. However to me it is the opposite. I am work with optical effects in both fields. The blue bonnets in my yard are blooming now. I took a photo from the above and it shows an amazing symmetry. So here is my painting. 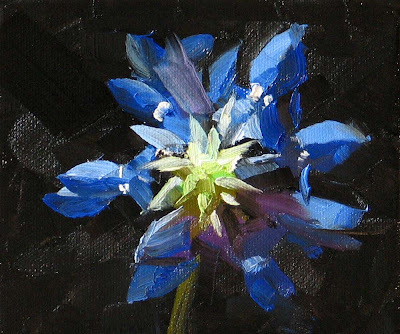 Does it convince you it is a blue bonnet? If you do not have the blue bonnets at your part of world, I hope this painting can give you a feeling of how beautiful Texas is. The book is very old. The apple is very new. The book was used to be as new as the apple. 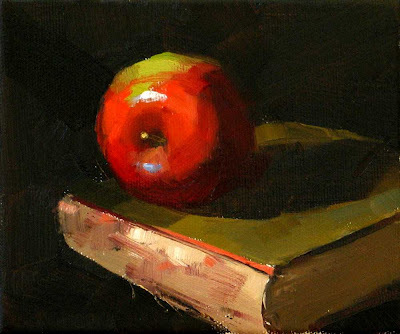 The apple will be as old as the book very soon. Wow! that is some deep stuff.